Ideal for use in HD broadcasting, the 230 VAC Kino Flo ParaBeam 410 DMX with Pole-Operated Mount displays a soft, flattering quality of light that is also directional. Well-suited for studios, the 410's parabolic reflector design maximizes output at about 16', its 4 separately purchased 55W True Match lamps performing like a 2000W flood light while making it comfortable for the talent. Lamp life, typically 2000 to 2500 hours, combined with low heat generation make for a rapid return on investment. The ParaBeam is dimmable from 100 to 5% locally on the fixture or remotely via onboard DMX. Lamp switching is another control feature, allowing you to switch off two lamps at a time. The light comes with a 90-degree louver (grid) to narrow the ParaBeams beam angle while a 60-degree louver is available as an option for further control of the output. A filter frame is also included for tweaking the color temperature. This Pole-Operated version allows the ParaBeam to be hung from a pipe grid and adjusted from the ground using a long pole. The fixture includes a yoke with an attached junior pin. Generally, fluorescents have a very broad soft light output. The light tends to drop off rapidly which means the units need to be positioned close to the subject they are lighting. The ParaBeam has a computer aided designed (CAD) parabolic reflector aimed at maximizing the light output at about 16 feet (5.0m). This achieves two things: it doubles the light output of the lamps and concentrates the light where the lighting director needs it most. Compared to the Diva-Lite, which uses the same four 55W compact lamps and the same ballast, the ParaBeam is twice as bright. Controlling the beam spread with louvers is far more efficient than barndoors and takes up far less room. The minimal light loss with louvers is the best solution when you consider the efficiency of the fixture and the versatility of the compact design. 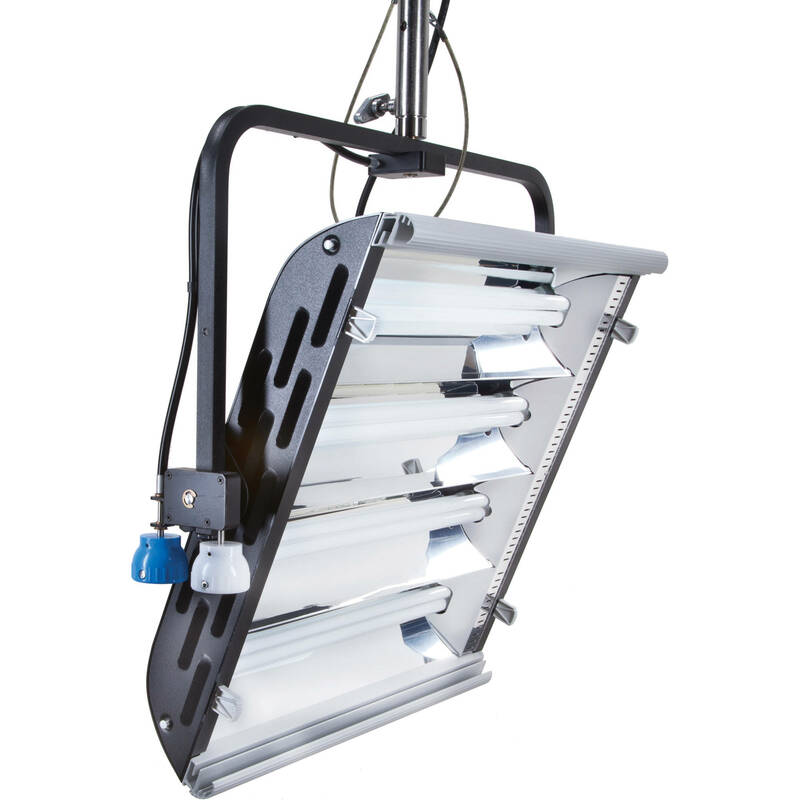 The ParaBeam 410 features DMX control of dim levels as well as four or two-lamp operation. The fixture operates on 1 or 2 DMX addresses. Address 1 allows dimming control of all four lamps; address 2 allows two channel control of two individual sets of lamps. Additional DMX control, dimming control and a power switch are conveniently located on a single control panel. The ParaBeam 410 can also be controlled manually. The user can select 2 or 4 lamp operation as well as dimming control. Unlike grids of quartz lights, Kino Flos can rely on a simple DMX lighting board to control the fixtures. The dimming electronics are contained in the fixture and do not require expensive dimmer racks to adjust line voltage and don't generate heat or noise. Household or architectural lamps contain high levels of green spectrum, which our eyes don't perceive as inaccurate. Film and television cameras do record this added green. True Match lamps are formulated to correspond to the spectral distribution curves of film and television cameras as well as look correct to the eye. They are designed to match the colors from studio quartz units or daylight sources such as HMIs. Full spectrum (CRI 95) lamps are available in 3200K and 5500K versions, as well as 420nm blue and 550nm green for blue and green screen applications. This gives the lighting director the option of mixing quartz hard light sources with fluorescent soft sources. Most lighting designers want the ability to use both qualities of light to enhance the set. For Kino Flo heat management is a critical design element of fixture design. The physical heat of the lamp directly influences color temperature and lumen performance and lamp life. The ParaBeam has two special cooling chambers at opposite ends of the fixture to provide ventilation. This ensures that the heat from the lamp is drawn out of the fixture and away from the body of the lamp. A temperature-stabilized lamp will provide consistent color performance. The deep parabolic reflector further prevents the heat from lower lamps to be transmitted to the lamps above. Color gels do not burn out or fade due to lower heat of fixture. Lamp life of a compact fluorescent for the television and motion picture industry is determined more by its lumen maintenance (consistency over its useful life) than by its actual burn time. While Kino Flow lamps may burn for up to 20,000 hours, their useful life or "quality time" is an impressive 2000 - 2500 hours or approximately 1 year of studio use. Lamp replacement labor is reduced by a factor of 10. The parabolic reflector design puts out a narrow lateral beam. When lighting a news set you very often are lighting two to three people at a desk. The effective area to be lighted is a broad rectangle. With conventional lights, the lighting projection would be a large round area. Barndoors or flags would be used to remove the light from above and below the rectangular area. This constitutes tremendous loss of light and efficiency. The ParaBeam puts the light where it is needed most. Barndoors or flags can still be used to eliminate spill above and below the rectangular area without reducing the efficiency of the instrument. Quartz soft lights rely on a white painted reflector that yellows and gathers dust. This alters the color temperature and reduces light output. The drop off is much like a bounce card. For this reason soft lights have to work close to their subject matter. The ParaBeam reflector is a precision design using highly reflective material that is shaped to project a beam of soft light at a focal distance of about 16 feet. This explains how 220 W of good design can equal 2,000 W of inefficient design. The ParaBeam features a unique method of servicing the ballast. By removing one of the side ventilation panels you expose the lock tabs for the ballast trays. Unlatch the tabs and pull the ballast out. Electrical contact is made through the edge card. No hand tools are required to remove and replace the ballast. This process can be done in seconds. The simplicity of maintenance is important for a studio that is operating for many hours per day.